I’m really digging the user interfaces Bing has put up. Google’s now copying their image display and some of their results refinement. I’ve been working on tokenization in Arabic for the LingPipe book and was using the text from an Arabic Wikipedia page as an example. 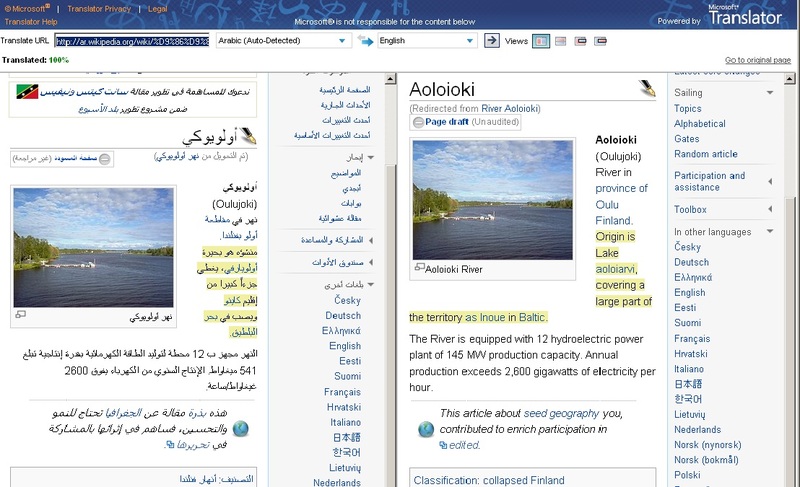 Yahoo!’s still using Babel Fish in last year’s UI; it doesn’t do Arabic. First, it uses language detection to figure out what language you’re translating from. Obvious, but oh so much nicer than fiddling with a drop-down menu. Second, it pops up the results side-by-side. Even cooler, if you mouse over a region, it does sentence detection and shows you the corresponding region in the translation. Awesome. I went back and looked at Google translate and see that they’ve added an auto-detect language feature since my last visit. Google only displays the translated page, but as you mouse over it, there’s a pop-up showing the original text and asking for a correction. I don’t know who did what first, but these are both way better interfaces than I remember from the last time I tried Google translation. And the results are pretty good NLP-wise, too. This entry was posted on August 10, 2010 at 12:05 pm and is filed under Carp's Blog. You can follow any responses to this entry through the RSS 2.0 feed. You can leave a response, or trackback from your own site. Google translator toolkit looks like a killer application to me, but there is no counterpart from Bing. Thanks for the pointer. Google’s translator toolkit looks great if you need to tune your results, which I imagine a whole lot of places do. I didn’t see any equivalent of their crowdsourced feedback on Bing, either. Given the arms race going on, I expect to see both apps leapfrogging each other. What’s interesting is that translation quality is fairly good on both sites, but it’s different on a sentence-by-sentence basis. Tradukka (http://tradukka.com/) added a UI layer over Google Translate, making for a much improved user experience. I use Google Translator ALL of the time but hadn’t ever used Bing’s. Thanks for the side by side comparison. I might need to expand my usage a little bit. Thanks for the comparison. 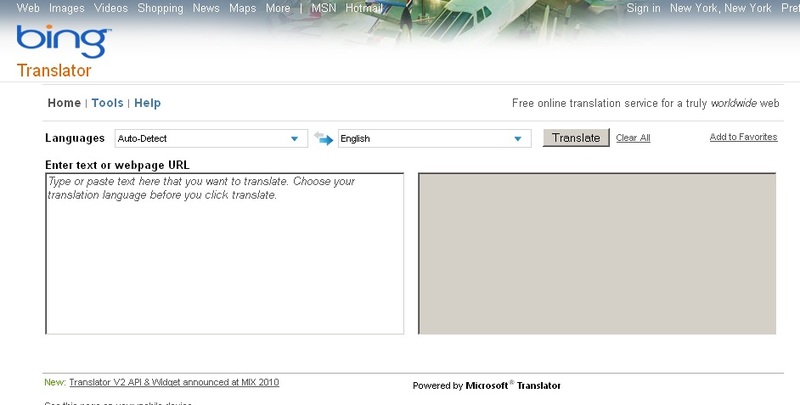 I have been using the Bing translator since the days of when it was called microsofttranslator, and always liked the GUI. However, I have repeatedly found the Google translator superior in translation quality (for German – English) which I attributed to a larger underlying parallel corpus. It s been a while that I checked, though, and I have no background information. Maybe somebody has a hint or link to share?